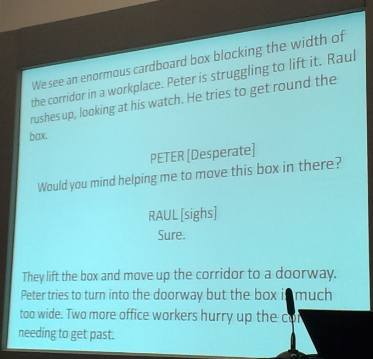 A theme that came up in two talks was the changing role of ‘non-visuals’ in ELT. 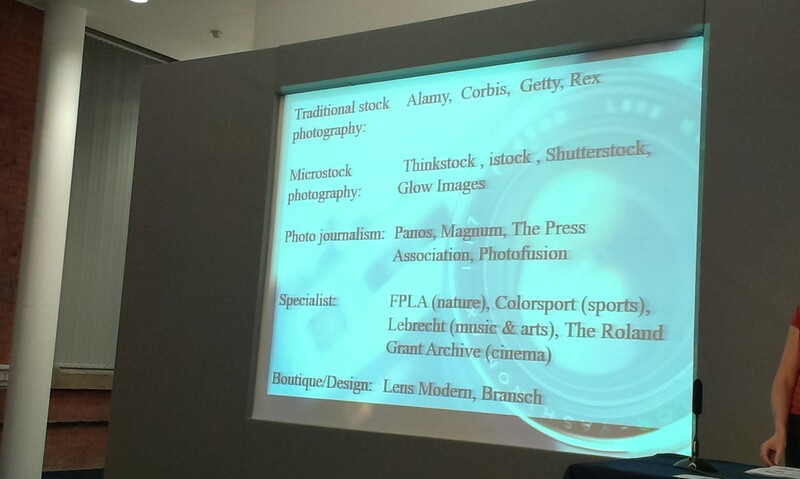 Ben Goldstein and Ceri Jones showed that images can be a lot more than just a pretty picture displayed next to the text. They also shared lots of image stocks, as well as tips how to navigate them to get exactly what you need. 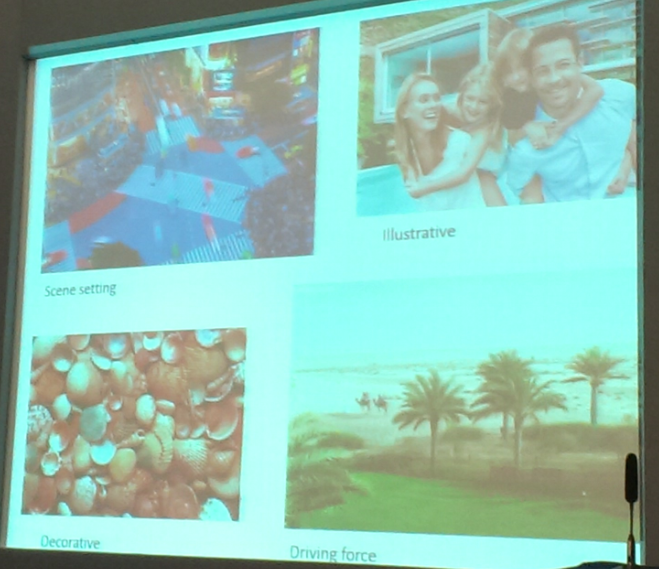 Later, Kieran Donaghy and Anna Whitcher explored the changing role of video in ELT and shared lots of ideas for activity types that can be used with video content. Nick Tims gave a wonderful, lively session in which he made a very strong point that whenever you find yourself frequently doing a certain action in several clicks, you should find a tool that does that action in one click. He also shared some great browser extensions that allow you to control and analyze your time spent online. Another important theme of the day was creating materials that reflect realistic language use. John Hughes shared insight into writing scripts for videos, focusing specifically on the ways to make them sound natural. He also shared some techniques for making scripts interesting, referring to none other than Kurt Vonnegut and his 8 tips for writers. Material writers are writers too! 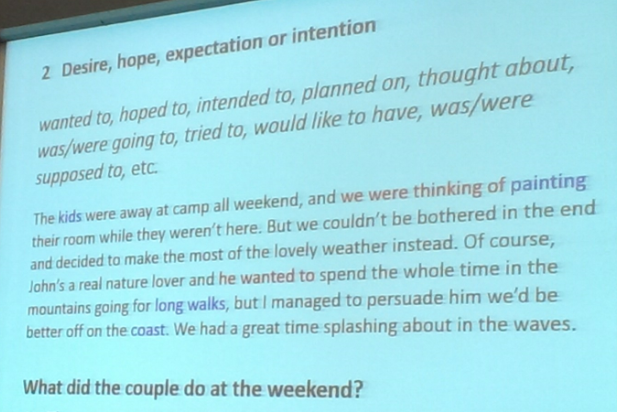 Julie Moore demonstrated how indispensable a corpus is for creating grammar and vocabulary materials – and also talked about the limitations of corpora. Evan Frendo developed the theme further, arguing that for a ESP materials writer the first thing to do is to get insider perspective on what is ‘successful communication’ in the setting they’re creating materials for. 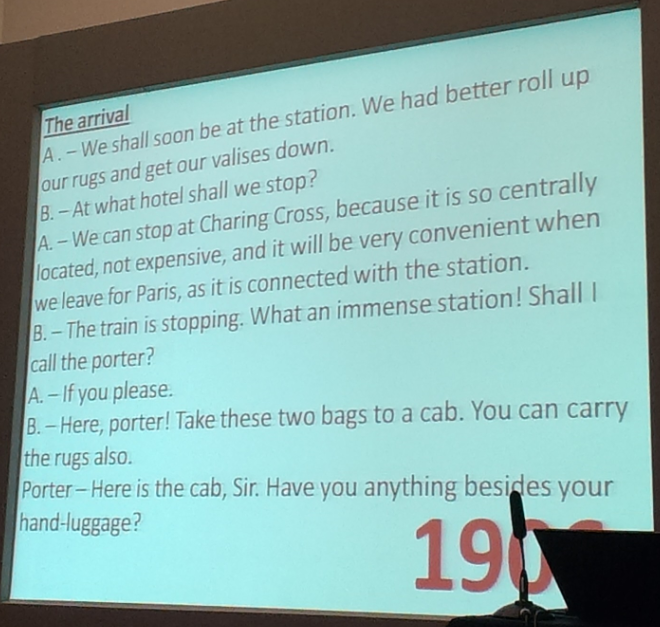 Materials in this context will aim to enable the learners to become successful communicators (as opposed to ‘improve their language level’), and consequently a lot of emphasis will be not on language but on intercultural communication. Finally, Christien Lee told us the story of his (mis)adventures in self-publishing. 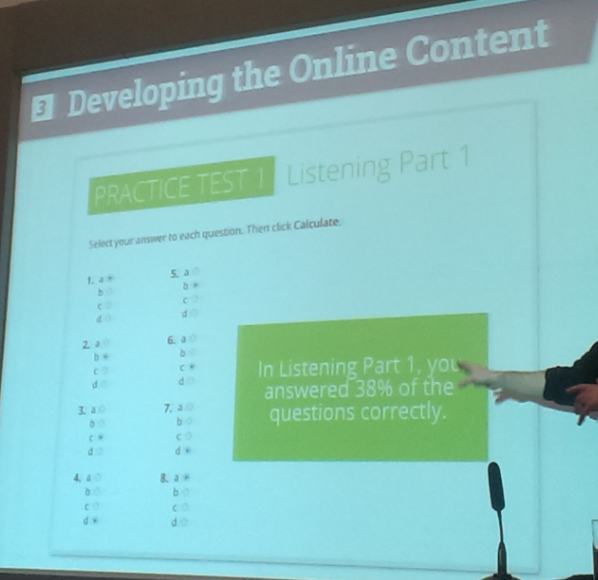 Along the way, he shared some very useful tips and tools for creating practice tests for high stakes exams – specifically, how to make sure that they are close in difficulty to the original tests. Below are the notes that I took during the sessions. I decided to put the whole ‘toolkit’ in one post to make things easier to find in the future. As a result, this is one long, long post, so use the links below to come back and explore the summaries of individual sessions. Many of the sessions were very practical and I tried to incorporate that into my notes: when you see [practice], there’s a task to try out. Notes in cursive after (most of the) summaries are my comments. The programme on MaWSIG website. 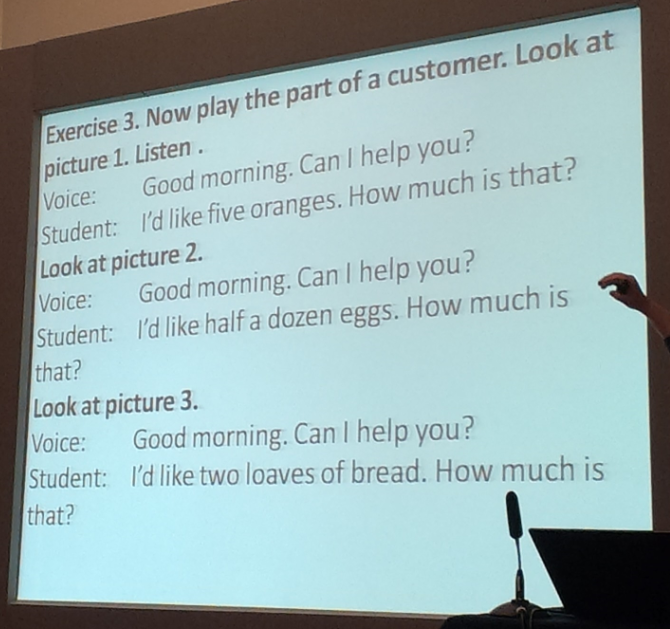 Sue Kay ‘Writing multiple-choice questions’. 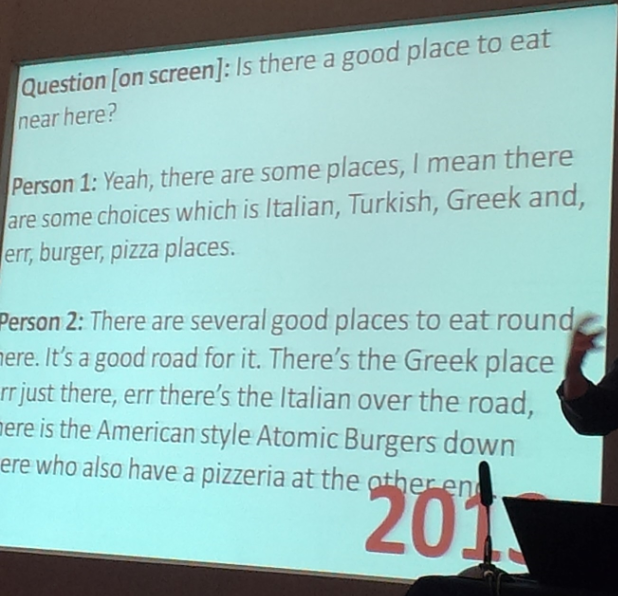 Sue Kay ‘learnt the hard way’ that there’s a lot to get wrong with multiple-choice questions (though it’s better to call them items as they might not be questions!). Why use them at all (and why are they the chosen format for exams like TOEFL)? give support to lower level students who can’t produce much. What are multiple choice items and the terminology? 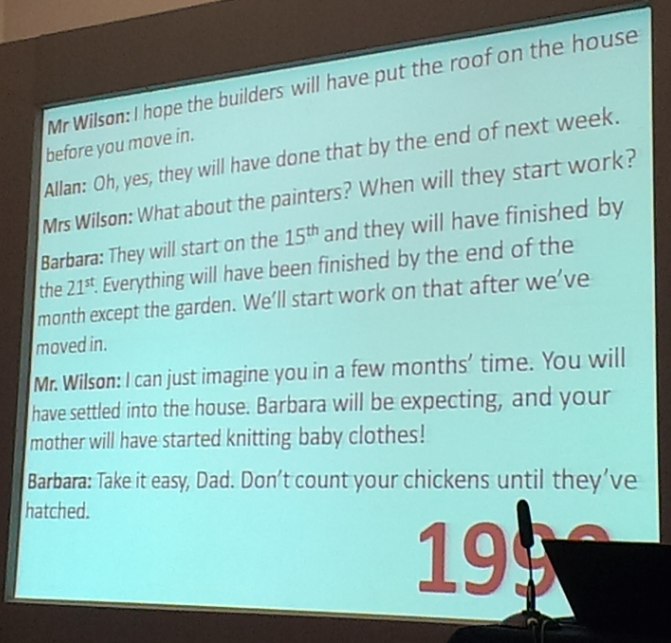 [practice] Sue Kay went on to refer us to an example of badly written multiple choice questions trying to identify what’s wrong with them. 3. Add the preposition to the stem and adjust the options (Rob thinks that his mother is concerned about..) TIP You should always finish the stem at a logical point, e.g. the end of a clause. 4. The only good one! (TIP: Options of the same length, the same style, no repetitions). 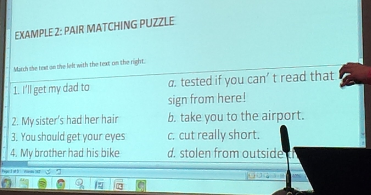 6 Quite easy to choose the correct answer without listening to the passage (knowing that Daniel is an ex-offender). 7. A and D have the same meaning (TIP: make sure items don’t say the same thing or cancel each other out). 8. Again, this question is easy to answer without listening to the interview (TIP: make sure that world knowledge isn’t coming into play). Write the text and the activity at the same time. 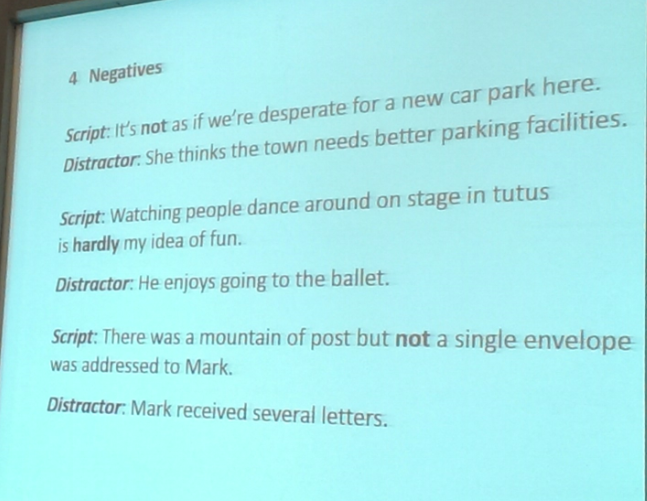 Don’t write the text or script first and then shoehorn distractors in. Here’s Sue Kay’s version. Notice how text is paraphrased in the options. Is there any difference between writing MCIs for reading and listening? (In Sue’s opinion, writing them for reading is more challenging; someone else’s point: you have to make sure they are spread evenly or students will miss something while processing the previous question). Is there any difference between writing MCIs for paper and digital materials? Might be, because for digital materials s/s might have the choice to stop / replay the audio – depending on the purpose of the materials. A very interesting session! I particularly enjoyed the practical bits: analyzing badly written MCIs and exploring ways to reformulate texts. The things that were particularly surprising for me were the observation that MCI stem should be a finished clause and that you write text and questions at the same time, incorporating distractors into both. Another observation that I found very interesting was the idea brought up by the audience that digital materials are more powerful in terms of teaching objectives as they allow more control on the part of the learners, and that questions might support those teaching objectives. 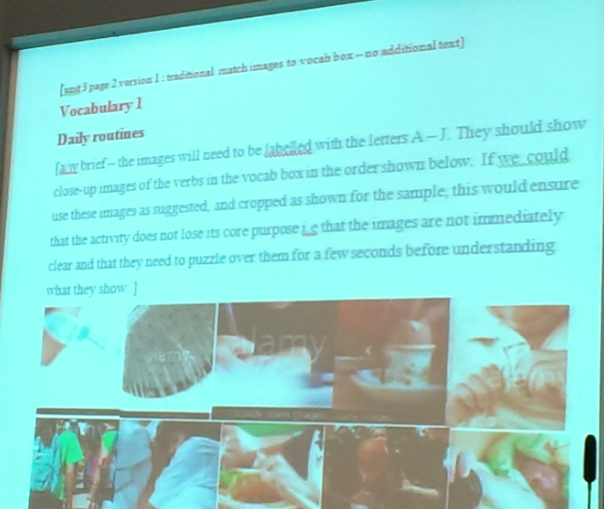 Abstract: In this session we aim to equip writers, both new and experienced, with tools and techniques for using and choosing images in their work. We will focus on the use of online image banks, the range of resources available and the different ways images influence the way we write. ideas for using images to inspire and inform the writing process. How has the role of visuals changed? They used to be purely decorative but now there’s been a shift to making images more central to the learning process (which is clear e.g. if you look at coursebook layout). How can we fine-tune our search for images to get something very relevant? At the moment, material writers have more say in what images to use than they used to. There are budgets for images – so most of the images have to be free/cheap, but sometimes editors will consider buying something more expensive if that’s a central image exploited a lot. the fifth source is to take them yourself! Working with a publisher, you’ll get a list of stocks the publisher works with – this is not exclusive, but if you want to use something else, this will have to be negotiated with the editor. How to search for pictures? A lot of stock images are too stereotypical (think ‘doctor’). Ben Goldstein’s answer to that: use more specific search term, e.g. ‘doctor working with a patient’, or adjust parameters (e.g. ‘two people’). Explore image types like selfies / infographic / fish eye / word clouds / #panodash (the same person on one image) / memes … – but careful with that because they go out of fashion (e.g. word clouds and the grumpy cat meme). When working with a publisher, there’s a photo researcher who looks for images and you’ll often need to write a description of what image you need. Tip: it’s mportant to include what you don’t want (e.g. 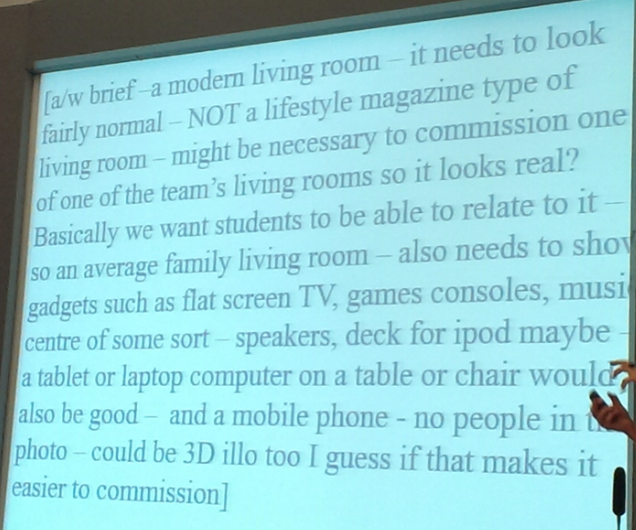 ‘not a lifestyle magazine type of living room’). Another very interesting session. I particularly want to explore panos to see if there are indeed lots of controversial images that might generate a lot of confersation and follow up on the passing remark to Lonely planet ‘The story behind a photo’ competition – I’ve run a quick search on google and there seem to be quite a lot of sites on that. It was also extremely interesting to learn about the nitty-gritty of writing for publishing houses and see examples of artwork briefs. Abstract: In this session I will present and demonstrate a range of tech-related tools that make me a better and more efficient material writer. This will include discussion of: hardware (set-ups, a few super-useful peripherals), software (applications, web-based customisations, some *superlight* coding), plus a few tips on time-management. Browsers: if you use Internet Explorer, you really should try something else. Monitors – one is not enough! Nick Tims uses three to switch between apps less (e.g. have answer key on one and the coursebook unit on another). To organize labels on the monitor, try fences. If you think of anything that you regularly do in more than two clicks on the internet, someone has probably a browser extension (software that extends the functionality of the browser). If you regularly search some service (e.g. Cambridge Dictionaries Online or Shutterstock), you can easily set up your browser to search there directly from your address bar. To set that up, position the cursor in the search box, right click > click Edit search Engine > choose a keyword that you can remember. Voila, now you can search that resource simply by typing your keyword in the address bar. More: Use snipping tool (Win) / grab tool (Mac) to snip out images. Save articles / pages you come across on the internet to Evernote. Helps to keep internet materials organized through tags, and also searches through your database when you search on google. 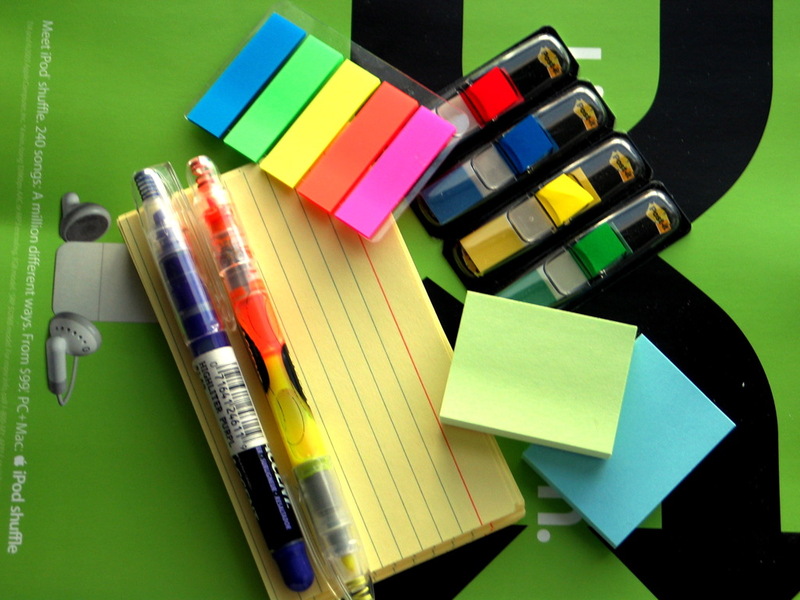 Tip: Evernote seems daunting at first, but actually it is easy! Free in its basic form; premium allows to share things. Practice exercises: automating boring bits! Marcos – you can record a series of actions on Microsoft Word and then use one click to perform it. Doesn’t involve coding, takes about 1.5 minutes to write one. Example: you might have double spaces in your text that you need to remove. Write a macros and do it in one click. Better still: install Teacher’s Pet – a massive collection of pre-written macros. RescueTime – send you a weekly report analyzing your applications/websites and distraction/productivity time. Don’t be afraid to kiss a few frogs – try stuff out that doesn’t work. This was just so so useful! After this talk I really want to make a commitment to time-saving tools and I’m going to research every single tool mentioned in this session. This really is a matter of attitude: I know there are great tools out there, but normally I don’t even spend time to learn useful shortcuts, which alone would save me a lot of time. I’ve heard of some of the tools Nick mentioned and even registered an account with Evernote and installed Teacher’s Pet at some point, but they seemed complicated and I immediately gave them up – but now I see that I really should’ve invested some time there, as there would definitely be great pay-offs in terms of time and organisation. Abstract: Audio and video ELT scripts recorded for course materials are often criticised by teachers for their lack of authenticity, overload of target language, dull characters and non-existent plotlines. In part, many ELT writers sometimes share this view but at the same time there are basic principles we need to follow which seem to limit what we can realistically do. In this session, I’d like to explore what those limitations are and then consider ways to write more creatively within them. 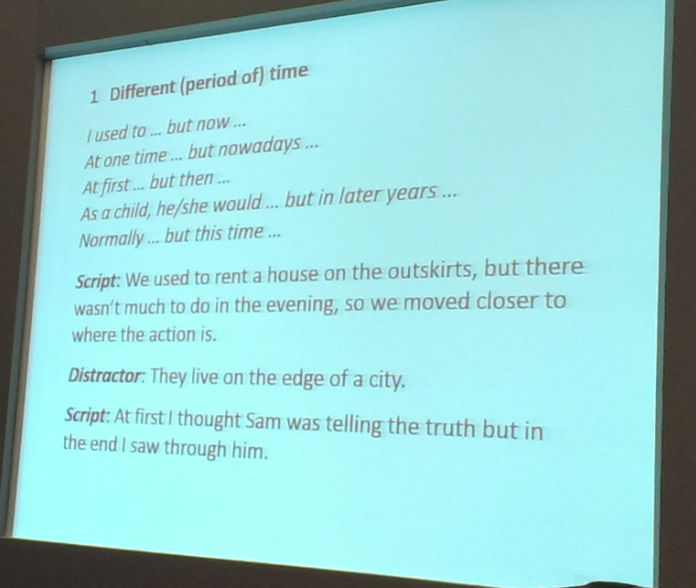 Participants will work together on some short ELT dialogues and then redraft these scripts by applying techniques used by writers for theatre and film. The session will give novice writers an insight into ELT scriptwriting for audio and video, and give experienced writers the chance to share and reflect on their own approach. The year 1555 – materials for Spanish speakers. And finally, this one was produced by John Hughes, but not actually written by him: recorded in the street, transcribed and used as materials. This way you’ll discover all sorts of interesting language that you’d never think of if you scripted it yourself. [practice] Look at the script that’s to be recorded. what criticism could we get from teachers using it? how can it be improved? in short, there’s too much target language in it and not enough incidental language. These are transcripts of unscripted recommendations that were recorded in the street. Implications: So, if you’re writing a script, which of these do we include? Probably not errors, but definitely fillers? 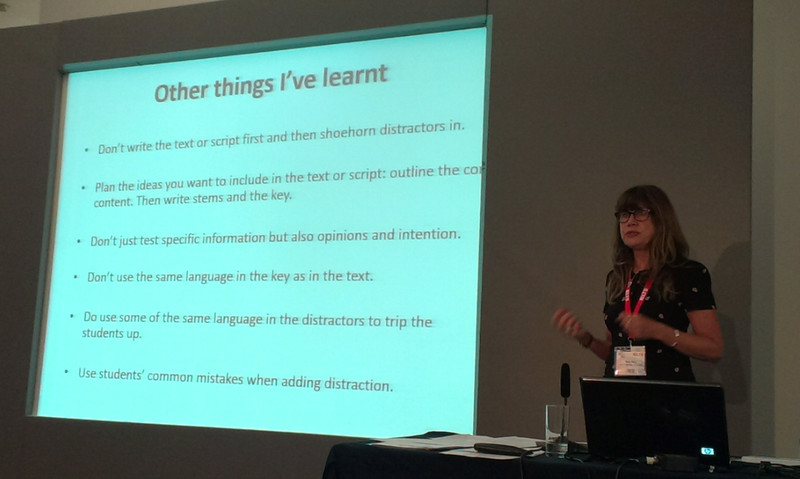 Rachael Roberts: Publishers have said to her ‘you use this word too much’ – yes, but that’s the way we speak! 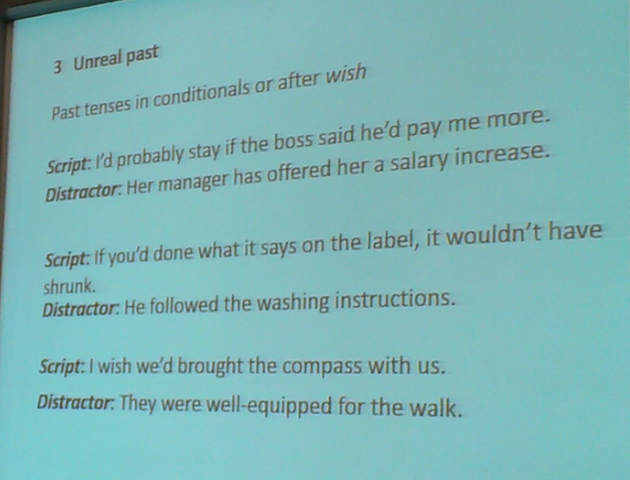 Evan Frendo: We’re used to teaching written grammar, but this is spoken grammar. People are only just becoming aware of those features (which are features and not ‘mistakes’, e.g. 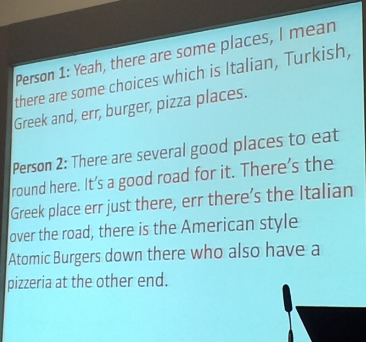 ‘choices which is Italian, Turkish… in the script above isn’t a ‘mistake’). Ceri Jones: But these features are still being removed by editors. Check out Kurt Vonnegut’s tips for writers! Show don’t tell (make it visually interesting). Sorry I’m rushing to a meeting. Maybe such and such could help you. Sorry, I’ve got a bad back. Think through the characters: what’s going on in their lives? Why do they need to move that box? But students want simple stuff that they can learn by heart. 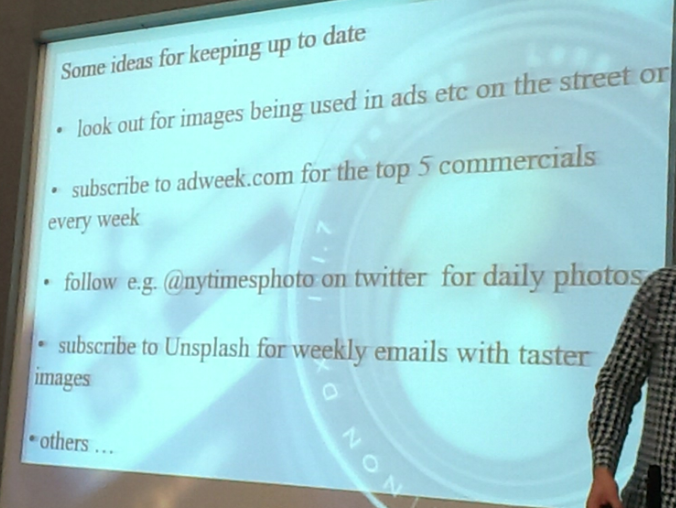 A lot of activities focused on today are from How to write Film and Video Activities. ‘glorified listening’. 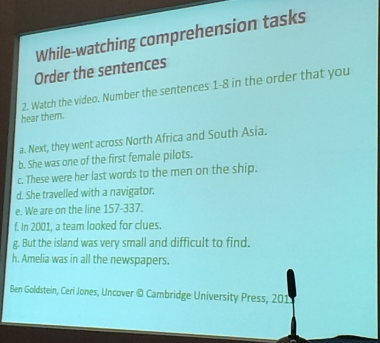 However video becomes much less effective in language learning if task is only based on non-visual content. Increasingly, like images, it’s been taking a more central role. Kieron Donaghy thinks that there will be an increasing demand for script writing. You choose the video. Huge choice. Looking for a video is overwhelming. You’re handed a video that you have to write activities for – what activity types to explore? Language learning is greatly enhanced when the film/video is integrated into the syllabus. Relevance to students’ lives, cultural background. If you think someone might be offended by this, they probably will be. 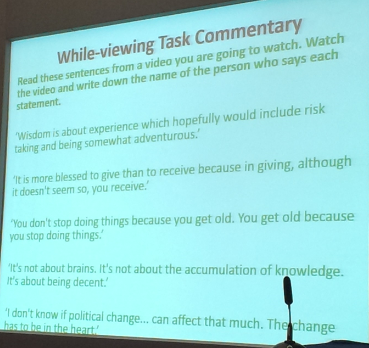 Task potential: video becomes much less effective in language learning if task is only based on non-visual content. [practice] We went on to analyze the following two videos considering the factors above. Be careful as the first clip contains sexual scenes. 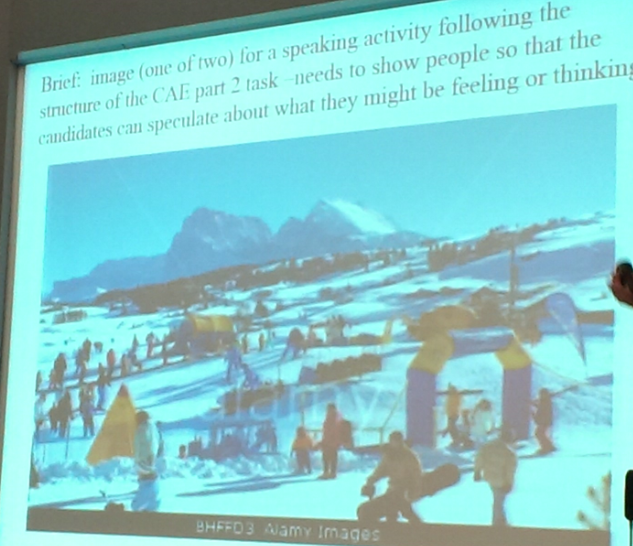 The task will depend on the pedagogical objective (normally the objective / outline of the sequence will be in the publisher’s brief – if not, better to ask them if there should be a certain structure). The answer to the question in the title is ‘no’. However, Julia can’t imagine writing without access to a corpus. What is a corpus and what are corpus tools? Terminology. 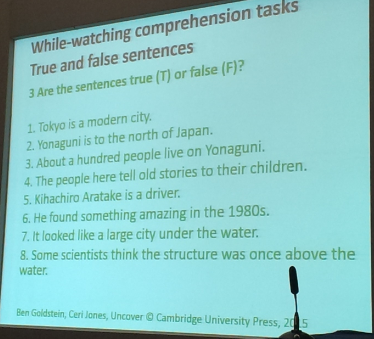 Concordance lines: examples of how the words were used in real language use; usually appear with the word you search for down the middle – usually called key word in context. If a sentence you like is cut off, in most tools you can click on it and see more contect. How to use a corpus? Vocabulary: collocation searches – see what words a target word is used with. E.g. a search for temper returns control your temper; keep your temper is there, but exploring examples we see that it was used in phrases, e.g. keep your temper in check – so the answer to the question ‘do we say ‘keep your temper’? is probably no. Julia showed an example of search on ‘beat around/about the bush’ on sketchengine. Tip: use settings for search for widest possible range – to get as much information as possible. This particular search returned some interesting variability, e.g. : Don’t tease too much about the bush. What is corpus not good for? It’s difficult and time-consuming (though possible) to search for language features that don’t involve specific lexis. E.g. to find about present continuous for future plans you’ll have to wade through all examples and see which ones are used for future plans. Copyright issues: OK to use short, unidentifiable chunks/sentences, but when you’re looking for examples of discourse markers, you need 2-3 sentences and you can’t steal it. But you could still inform yourself but not copy it. Not good for learning any info if the type of corpus you’re using doesn’t represent the kind of language you need! Things to consider: spoken vs written? genres? AmE vs BrE? expert vs student? Not to be followed blindly! Free open corpora: normally they’re free because there are some issues. Dictionary DVDs e.g. Cambridge advanced learner’s dictionary allows to run advanced searches – could return indispensable information. Abstract. Lots of teachers talk about tailor-making materials to suit particular groups of learners or a particular client: in ESP it is considered normal practice. Tailor-making materials involves understanding the learner’s context and priorities, and it also involves analysing the target discourse and working out what the key language is. In this session I will introduce some materials I have helped design for corporate clients, and discuss some of the thinking that went in to the development. 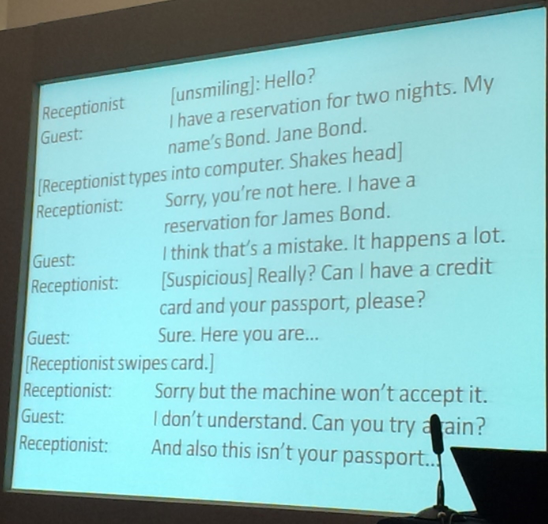 Language needed for the learners can be very specialized (IT specialists creating software for oil industry will need vocabulary from oil industry – so there cannot be a universal course ‘English for IT specialists’); material writers spends a lot of time trying to understand company discourse. In ESP we bridge the gap – find out what learners need to do their job, where they currently are and where they need to be. This gap is not ‘the gap between B2 and C1’. This gap is not ‘learning to create Steve Jobs style presentations’. You cannot bridge that gap without researching the company. So what can this gap be and how to research it? Research lexis. Working with a corpus of texts produced by the company. Tools: e.g. Wordsmiths tools. The concept of ‘lexis level’ shifts: general English C2 vocabulary will probably be very high frequency in workplace setting. Research typical situations and intercultural communication issues. Get stakeholders to provide you with insight. Technique: Record a real phone conversation, get the participant to comment on how typical it is and keep asking yourself about each bit of insight: so what in terms of training. Research genres. Example: What do people in this company mean by a successful presentation? in some companies presentation slides are used as documentation, so the conventions for the genre are totally different from ‘standard presenting advice’ found in all BE coursebooks. Not all language at work is language about work. Some research says, it’s 50/50 content/interpersonal communication. So, small talk is a hugely important component of the course. One-sentence summary: when teaching in company, get insider perspective on what successful communication in this setting is. 1. What shall I self-publish? Why? How? Where? 2. How to write good quality content? Christien’s background is in testing, which means tough competition. He went for Canadian test, where there’s a lot less competition. There were already practice test books, so he decided to create a self-study guide. He spent several months creating materials and then organized some workshops to test his materials with students, and the response was absolutely awful, as it turned out that in fact all the students wanted was practice tests! So all the time spent researching for the self-guide had been wasted. Why online component? Stops students from buying one book and sharing it. The plan: the book comes with an access code to an online component which has the key and the answers. Potential return of up to 70% (as opposed to royalties from publishers, which also come after quite a long time). A lot of editing work involved. How to handle editing, book layout, audio, and so on? Do it yourself (Christien mostly does scripts himself). Use crowdsourcing / freelancers. But you have to make sure you trust the freelancer and ensure quality (e.g. for audio). Friendsourcing – which also means networking with your friends. he had to put things on hold and got unexpected interest from publishers, so he’s exploring other options. I really enjoyed Christien’s ‘story so far’ and I really hope that it will have a very very happy ending! My most important take-aways from this session are the need to do market research/piloting ideas as soon as possible before investing lots of time and effort in them. What I found particularly fascinating is was his ideas for grading texts to make them match commercial exams as closely as possible. I’d always assumed that the only way was to try materials on students and collect huge amount of statistics and it was very interesting to see ways to make some short cuts there. So, the outcome of MaWSIG PCE? A treasure trove of tips and links to explore and some bits of very interesting insight into the world of publishing. I don’t remember when I last learnt so much in one day. What a great event!